I think Naomi is out to get everyone to give up their New Year's Resolutions before the first week of January is even over. 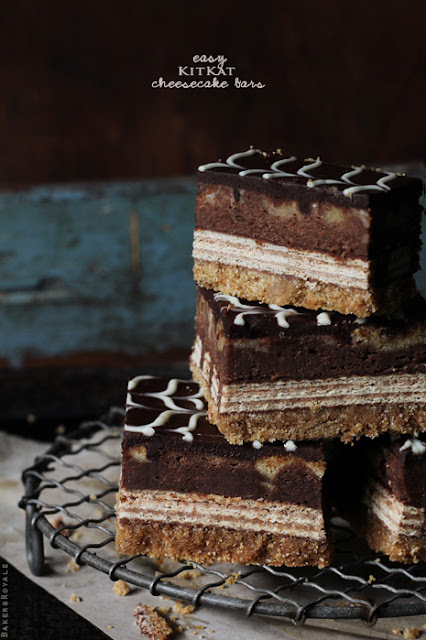 Why else would she post something as amazing looking as these KitKat cheesecake bars and call them EASY to make! These are going on the list of treats to make for Valentine's Day. I am pretty sure those swirls on the top can be manipulated to look like hearts. And chocolate is always on the menu for Valentine's Day. You can get the KitKat cheesecake bar recipe over at Bakers Royale.